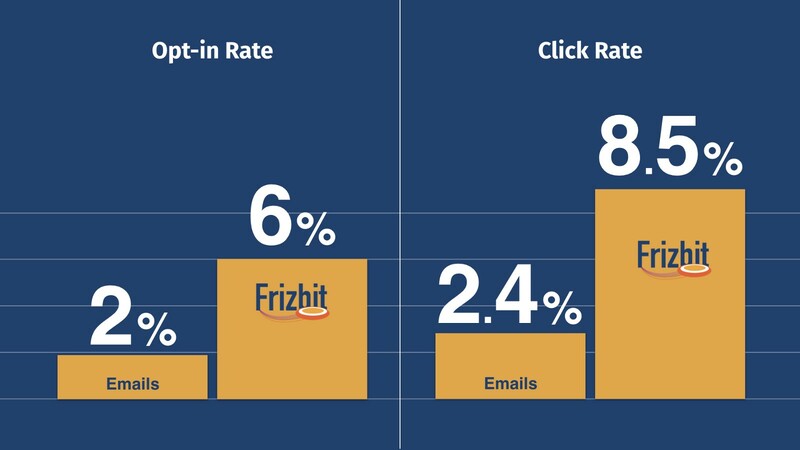 – Web push notifications have x4 higher click rate than emails, with an average click rate of 8.5%, while emails have an average click rate of 2.4% according to Mailchimp. 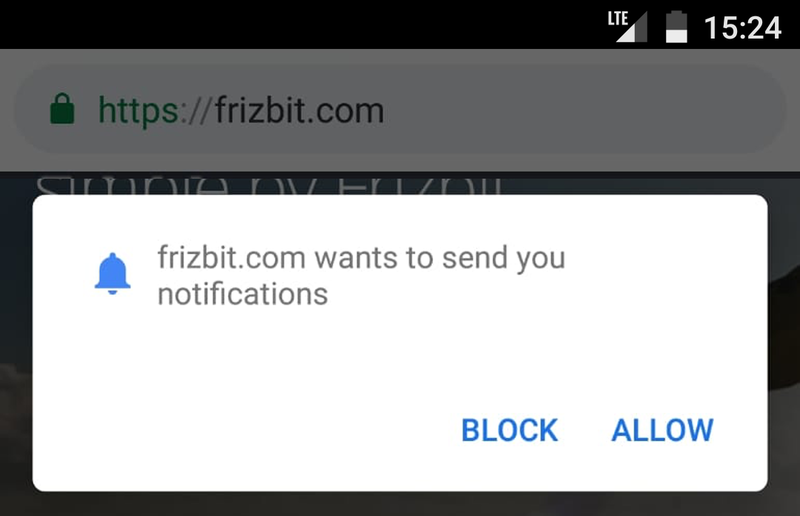 First, most of the web push notification providers, including Frizbit, have a freemium tier that you can use free, until reaching some specific number of subscribers. This gives an adequate time period to try and see the effect. Second, the pricing of most of the web push notification services is based on monthly subscription fees based on the number of subscribers, just like e-mail marketing services. Except two major differences; the monthly cost is usually lower than email marketing and also there is no extra cost charged per message, you can send unlimited notifications within your plan. Third, usually there is neither one-time on-boarding fees required to setup the solution nor forced yearly contracts which requires you to pay upfront. Thus, absolutely there is no reason not to start using web push notification, from an economical point of view. You only need 15 minutes in total to start collecting web push notification subscribers: 5 minutes to create an account on a web push notification platform like Frizbit and then 10 minutes more to install the codes on your website. After spending these 15 minutes, you can start collecting web push notification subscribers directly and your subscriber collection pop-up starts appearing on your website real-time. It’s very easy to build a subscriber base, because all you need is getting the permission from your users on your website to send push notifications to them. They can simply opt-in to your notifications with a single click to the “Allow” button on the pop-up that appears on your website. On desktops, it appears on the top left corner of the browser screen, while it appears on the bottom part of your screen on the mobile devices. Web push notifications is an opt-in based (subscription-based) channel just like e-mail or app push notifications. So, more subscribers you collect means a larger audience that you can reach by sending a notification directly within seconds. That’s why, easiness to opt-in is quite crucial on the success of these opt-in based channels. Imagine an end user -which all of us are- who would like to get updates, news or offers from a specific brand, company or media. I don’t have any other choice of sharing at least a type of contact information. – in case of social media, I have to to share my profile, in most of the cases which have my full name on it. That’s really bad! Not only because I’m forced to share my personal information with the advertisers, but also my personal data, my e-mail address or mobile number can leak to 3rd parties that I have no relation with. One of the best things about web push notifications is that it absolutely doesn’t require any personal data from the end user, which is quite contrary to other retention channels such as e-mail, SMS or social media. Even when a random not-logged-in first time visitor just clicks on the “Allow” button for notifications, then you can re-engage with him/her whenever you want. Also, if your web push notification provider complies with other requirements of GDPR as a data processor and as a data controller, you would have a new channel to retain your customers, still being GDPR compliant. PS. Yes, Frizbit is GDPR compliant! I totally understand. But web push is really different. 1. Instead of writing manually each time, you can automate! 2. Notifications are super concise! Web push notifications are really concise and you just need to type a message of 3 lines, the maximum. What’s the time required for that? 10 seconds, 30 seconds? Something around that. Then you are already on the screen of your audience. You don’t need to spend an hour time writing and designing the email. 3. Response time is super short! It may take more time if you have much more subscribers, but usually notifications are delivered in a couple of seconds. Then, the reaction time of the end users is also a seconds. Within less than a minute, you will see new sessions are created on your website and users are engaging with the page on your notification on real-time analytics. App push notifications are great. They are very effective and engaging. But, well, you need to have a mobile app for that. Let’s say you have already spent a lot of time, budget and effort to have an app designed and developed. But then, you have to spend budget to have it installed on the mobile devices of your audience. Even in that case, guess what, you have still most of your traffic on your website rather than your app. 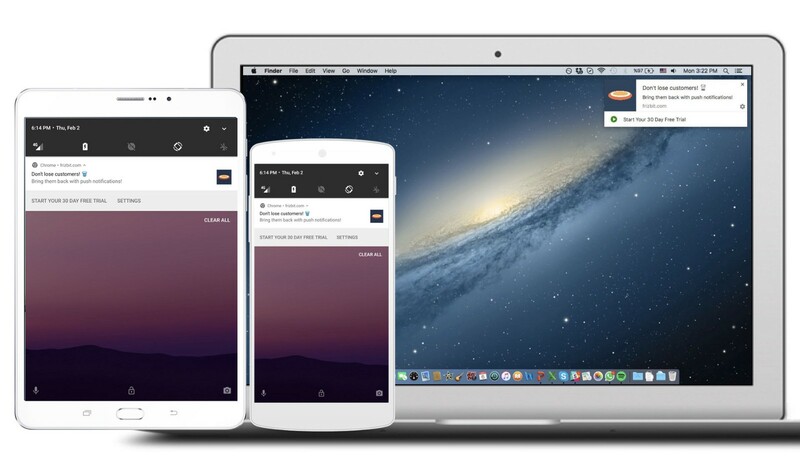 Via web push notifications you can reach both mobile and desktop users, and that rocks. But keep in mind that iOS still doesn’t have support for the web push notifications, but the large majority of the mobile devices are Android. So you can reach the 68% of the mobile devices in the world with web push notifications as of September 2018. Currently web push notifications are supported by almost all the major browsers including Google Chrome, Mozilla Firefox, Safari, Opera, Microsoft Edge. So, you can reach 89% of all the browsing audience not using iOS. Overall, you can reach 74% of all the web browsing audience via web push notifications, including iOS and other browsers not supporting notifications. Well, I can totally understand you, if you think web push notifications today as notifications which are written manually, sent as bulk without any segmentation and the same message for all recipients, which are not appreciated by the end users most of the time. That has been the usage for a long time and it still is, because of wrong usage of some marketers and incapability of the web push notification providers. However, it’s not the case any more. I’m sure, you are fond of using personalisation parameters in e-mails, emails triggered with user behaviour such as cart abandonment or retargeting ads. Now, all is possible with web push notifications such as cart abandonment notifications, product retargeting notifications which are personalised with the name or product. But of course this can happen only if you choose a provider who have these capabilities, like Frizbit.